Today marks the 2nd challenge with the fantastic new Design Team for Scrapalicious USA. The theme this time around is "A Cut Above"...so, that means anything that entails a special cut. Thinking, die cuts, paper punches, fussy cutting...you get the idea! 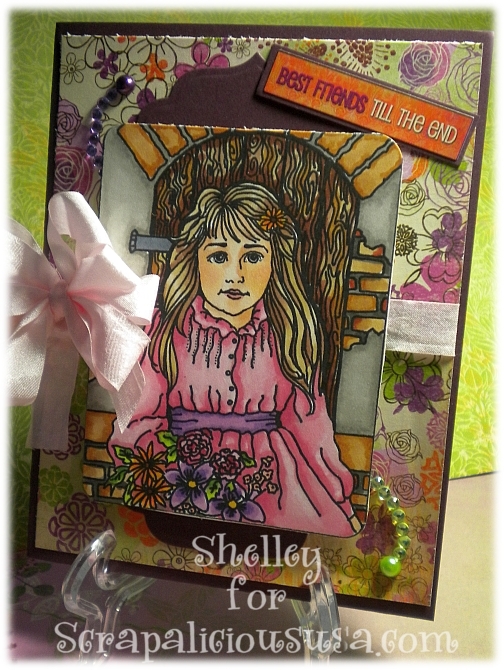 I was in a coloring mood and thought I would pull out one of my Shelley Bean Stamps (since Scrapalicious USA sells them at her store) and make a card using the ever so pretty Bo Bunny paper I got also at Scrapalicioususa.com! Bo Bunny Paper Pack "Garden Girl"
Bo Bunny Cardstock Stickers "Garden Girl"
Bo Bunny Jewels "Garden Girl"